There’s only a tiny bit of snow on the Hill right now, left over from last night. Like everyone else in Seattle, we are waiting to see if today’s promised snow day arrives. (KIRO’s Sam Argier just tweeted “Latest computer model coming in much more aggressive with Wednesday’s snow” and showed a 1″-4″ predicted snowfall for the city.) A winter storm warning is in effect until 10 a.m. Thursday morning. Keep your eyes on School Report for any potential closures, and be aware that the snow may hit us during the evening commute as it did during the November storm—consider leaving your car home, if possible. We probably won't get this much snow today -- we hope. 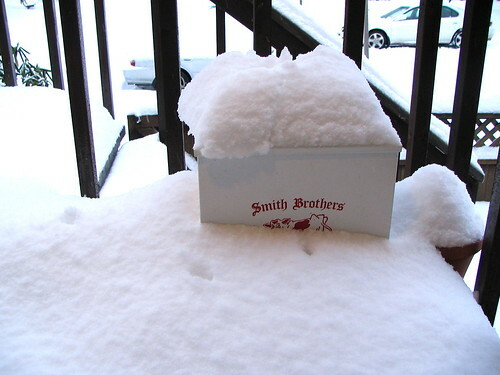 Photo from the December 2008 snowstorm, by Wendi.